0004. AMRC Collection, Williams Afghan Media Project, Williams College, Williamstown, MA. 0015. AMRC Collection, Williams Afghan Media Project, Williams College, Williamstown, MA. 0025. AMRC Collection, Williams Afghan Media Project, Williams College, Williamstown, MA. 0054. AMRC Collection, Williams Afghan Media Project, Williams College, Williamstown, MA. 0084. AMRC Collection, Williams Afghan Media Project, Williams College, Williamstown, MA. 0124. AMRC Collection, Williams Afghan Media Project, Williams College, Williamstown, MA. 0139. AMRC Collection, Williams Afghan Media Project, Williams College, Williamstown, MA. 0226. AMRC Collection, Williams Afghan Media Project, Williams College, Williamstown, MA. 1170-12. AMRC Collection, Williams Afghan Media Project, Williams College, Williamstown, MA. 118-34. AMRC Collection, Williams Afghan Media Project, Williams College, Williamstown, MA. Dupree, Nancy. 84-28. Dupree Collection, Williams Afghan Media Project, Williams College, Williamstown, MA. K-00301-08. AMRC Collection, Williams Afghan Media Project, Williams College, Williamstown, MA. "Karl Marx." Digital image. Wikipedia Commons. Accessed September 4, 2010. http://commons.wikimedia.org/wiki/File:Karl_Marx.jpg. Kingruedi. "Evstafiev-afghan-apc-passes-russian." Digital image. Wikipedia Commons. Accessed September 4, 2010. http://commons.wikimedia.org/wiki/File:Evstafiev-afghan-apc-passes-russian.jpg. L-00345-01. AMRC Collection, Williams Afghan Media Project, Williams College, Williamstown, MA. L-00347-01. AMRC Collection, Williams Afghan Media Project, Williams College, Williamstown, MA. Q-00481-26. AMRC Collection, Williams Afghan Media Project, Williams College, Williamstown, MA. Q-00486-30. AMRC Collection, Williams Afghan Media Project, Williams College, Williamstown, MA. Q2-01282-20. ARC Collection, Williams Afghan Media Project, Williams College, Williamstown, MA. Q2-01282-21. AMRC Collection, Williams Afghan Media Project, Williams College, Williamstown, MA. Q2-01283-34. AMRC Collection, Williams Afghan Media Project, Williams College, Williamstown, MA. "Untitled Recording." In Sakata Field Recordings Reel 2-5. Hiromi Lorraine Sakata, 1971. V2-01425-07. AMRC Collection, Williams Afghan Media Project, Williams College, Williamstown, MA. Marxism encourages the working classes to rise up against their overlords and seize political power to advance collective ownership. In this way, Marxists believed that a social revolution would inevitably lead to a communist system. But it didn’t work that way in Afghanistan. There were strong ties within the community to the leader. And when the Marxists came to power in 1978, they in many cases, tried to turn local communities against those leaders. But because of those strong ties of reciprocity, people rejected the Marxist idea that these people were exploiters or feudals or feudal lords. Rather, they saw them as important lynch pins of their community, and to whom they owe obligations and whose wealth and status was recognized to be their god-given right, that they’d earned it and the Marxists had no right to come along and try to take it away. In 1979 the Soviet Union sent troops across the border to provide support to the Marxist government. Countries around the world were uneasy with Soviet aggression and the apparent expansion of the Soviet Union. At that point or shortly after that period, the Pakistan government, and with the assistance of the Americans, the Saudis and other foreign interests, began to funnel money, weapons and other kinds of support to mujahideen, to Resistance Fighters who were opposed to the Marxist government in Afghanistan and to their Soviet sponsors. From that period on, new forms of wealth and new forms of power began to pour into Afghanistan in the form, for example, of AK-47 machine guns and RPG shoulder-launched rockets that were used to take out armored personnel carriers and tanks and that sort of thing. Despite this influx of firepower to arm the Afghan resistance, the main advantage the Soviets had was their control of the air. Attack helicopters and bombing campaigns turned homes into rubble across the country. Up to a quarter of the Afghan population became refugees in Pakistan and Iran. Most ordinary Afghans who could not flee dug in and tried to wait out the war. Once again, as had happened across history, a war between global powers was being fought on Afghan soil. And once again, the foreigners had underestimated Afghanistan. As it turned out, the Soviets were unprepared – and vulnerable. For most of the 1980s, the war was a stalemate. The Soviets held the urban areas and a few bases, but the Afghans controlled the highways and rural areas – up to 80% of the country. Of the leaders of the Afghan resistance, the most famous was Ahmed Shah Massoud, or the “Lion of Panjshir,” who commanded thousands of troops against the Soviet occupiers. But neither side could prevail until the introduction of Stinger missiles, which Afghans used to shoot down Soviet helicopters and bombers. 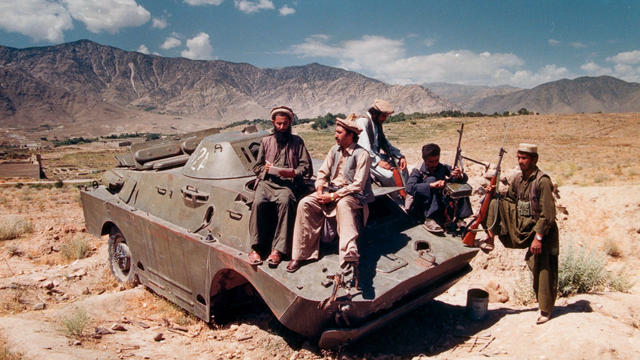 This changed the balance of power of the war—and Afghanistan’s future. By all accounts, a Marxist revolution and a Soviet invasion should have led to a communist state. But it didn't work that way in Afghanistan.